Sainsbury's is pushing on with plans to open 250 Argos outlets in its stores as it takes on low-cost rivals and Amazon. The supermarket chain has opened 50 Argos concessions since taking over the catalogue retailer and Habitat for £1.4bn last year. Argos boss John Rogers said the retailer would still maintain its High Street presence. But he also called for "radical reform" to business rates to help shops compete with online retailers. Argos announced on Thursday that it would turn 60 more of its 800 UK stores into a digital format - where customers can order on an iPad rather than a catalogue. Mr Rogers said the change and the Sainsbury's concessions would not bring job losses. A major reason Sainsbury's bought Argos was for its delivery network, as it looked to deliver goods to customers quicker than rivals such as Amazon. But unlike Amazon, the group pays a large amount in business rates on its shops. That bill that was more than £500m last year for Sainsbury's, Argos and Habitat, Mr Rogers said. "We would ask government to radically reform business rates. It's a very anachronistic tax in this very digital world," he told the BBC. But he added: "That doesn't mean to say we can't compete with Amazon." The Argos model, which delivers items to shoppers that day if they order before 18:00, is "winning in this market", he said. 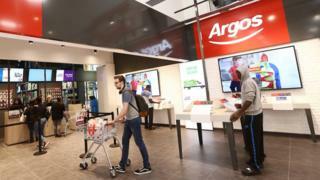 Sales in Argos concessions are growing rapidly, the company said. "It's not just about the Argos sales that we've seen go up, but Argos customers come into our stores and they also pick up a pint of milk and a sandwich," Mr Rogers said. The UK's biggest supermarkets face intense pressure from low-cost rivals Aldi and Lidl, as well as changes to shopping habits as consumers move away from the big weekly shop. Competition is also coming from US online retail giant Amazon, which launched a grocery delivery service in the UK last year. Sainsbury's said it was also rolling out 10 more mini Habitat outlets in its supermarkets.